Painless donation management and online giving for non-profits and NGO’s. All non-profits run into donation tracking issues at some point. Massive spreadsheets, inconsistent data entry, volunteers that move on shortly after training. Donor Tools solves these problems. You’ll flip when you see how simple it is to use while remaining remarkably effective. It’s the next step for your non-profit. "Donor Tools user friendly interface and quick, helpful customer service has made for an easy transition from our former donor management system." "I love the accuracy and flexibility that Donor Tools offers. I can track donors on a monthly basis, from a specific event, or from a specific time period." You get checks, cash, in-kind gifts. More and more donations are coming in online. Donor Tools provides an easy way to capture ALL of your donations. Yes, today! Donor Tools provides your organization a branded web page to accept online donations. Fill out a few fields, upload your logo, and link to the page from your site. Donor Tools has been saving thousands of non-profits time and headaches since 2012. How much did Michael give last month? How about last year? Who are all the donors that gave more than $500 last year? You shouldn’t need a computer science degree or intense training to answer these questions. With Donor Tools you don’t. 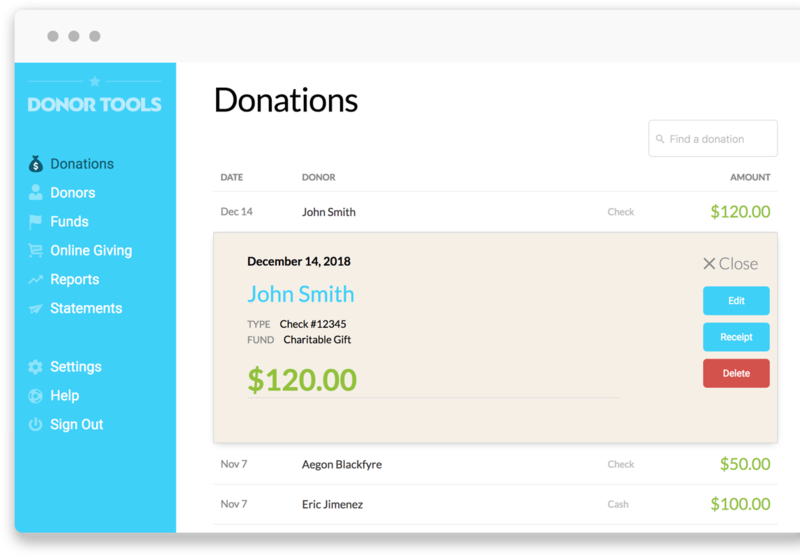 Donor Tools charges a flat monthly fee. Others take 1-5% of your donations. No complex feature comparison charts here. Donor Tools charges a flat, low monthly fee. You can cancel at any time. No contracts and no credit card needed to get started. Watch and see why Donor Tools is different. Donor Tools can accept credit & debit card donations online (from a mobile device or desktop) and almost any type of physical donation (cash, check, in-kind gift, etc.). You provide some basic information about yourself and your organization and jump right in. You can set up online giving and start collecting online donations today. You can also start entering physical donations, create your funds, and run reports. There are no limitations during the trial. If you wish to continue after the 30 days, you’ll be asked to pick a plan and enter a credit card for billing. Absolutely. As long as there is an email address in Donor Tools for the donor, a receipt will be sent out. We reccomend you also consider a donation thank you letter for special gifts. Can I use Paypal or another payment processor? No - but that’s really for your benefit. We’ve negotiated the lowest rates and partner with WePay, an industry leader in online payment security. The tight integration between Donor Tools and WePay provides a total solution that’s really hard to beat. There are no contracts, set up fees, and no termination fees. To use Donor Tools you must be a non-profit or NGO with 501c3 status, registered in either the United States or Canada. No, you simply pay your monthly plan fee and if you decide to receive online donations, you will be charged a processing fee on each transaction. This processing fee is required industry wide for all credit/debit card transactions and will most likely be higher with any other merchant account provider. We have worked hard to negotiate ultra low credit/debit card processing fees on behalf of our customers and pass those saving along to you. We have also been able to negotiate the same rate for all cards (US & CA), while others in this space charge different rates for different card types. Being a Donor Tools customer gives you access to these low rates and we’re committed to continuing to lead the industry in this area. If you are using an older version of Donor Tools we can help you move your data into the latest version. Beyond that. we don't yet have a way to import a donor's giving history. If you decide to make the switch to Donor Tools, you may need to issue two end-of-year statements to your donors this year, one from your old system and one from Donor Tools. You can use any modern web browser to access Donor Tools. Chrome, Safari, Firefox, IE 11+ are all supported.